Out of shape? Age catching up? Too much garden? Maybe the answer is all of the above. Yesterday and this morning, I worked in the garden doing a lot of bending over and stretching, and I really feel it now. It is a good thing I was able to accomplish so much or I’d be discouraged to feel this way with not much to show for it. I cleaned out the entry garden making it ready to add some summer annuals which I will try and purchase Saturday. I really hated pulling out the violas which were still doing well but need to be pulled out by May because of the heat. First, I had to rake up 500,000 (not an exaggeration) magnolia leaves. With being out of town for five days, the leaves really piled up. Any that fall in the entry garden can not be raked up but must be picked out. Dear hubby made me a nifty little picker several years ago, so while it is not hard, it is time consuming. I did move some things around. The Aztec grass that was scattered around the beds were moved to the front, and several red gerbera daisies were moved to sunnier areas and grouped together. I also had to move a daylily that was being crowded by a hosta. Most of my time was spent cleaning out the dead fronds on the holly ferns and pulling out the hundreds of Limelight artemesia that have sprung up. I have been trying to get rid of that artemesia for three years now, and I still expect some to appear later in the spring. Why or why do they sell this stuff? Buying plants tomorrow and planting them is the fun part of gardening, and after all this grunt work, I am looking forward to some fun. I just hope my muscles will cooperate. Flowers seem to be just exploding out around here, and two more varieties have opened up. I’ve been out of town for the last four days, and I was so afraid I would miss some of the flowers that are just opening up. Thank goodness, I didn’t. 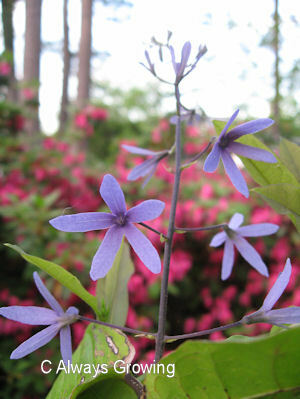 While several plants had started blooming, the flowers were still in good shape when for me when I returned. 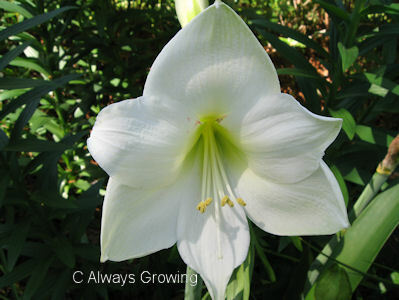 The white amaryllis are looking so good. It took a few years for them to bloom after I planted them, and this year is the best blooming these lovely flowers have had yet. 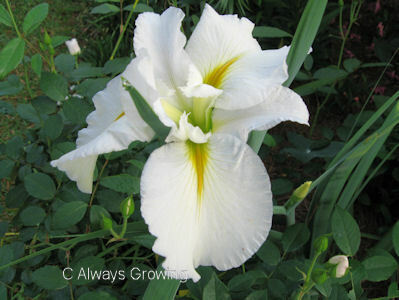 I have these planted with other white flowers (Iceberg roses and Marie Dolers, a white Louisiana iris). 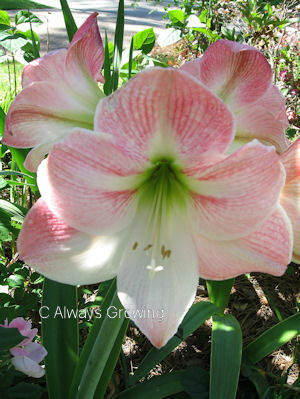 Also blooming right now is the Appleblossom amaryllis. Not all of the Appleblossom amaryllis have bloomed this year, and I am not sure why. Last year they all bloomed and made a gorgeous display. I guess even plants need some time off every now and then. 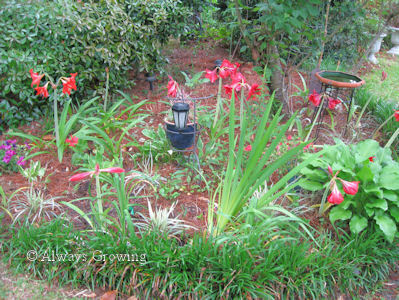 Here’s hoping that next year will bring back the abundance of flowers from these amaryllis that I had last year. I’ll have to post photos of the other flowers that started blooming while I was gone tomorrow because I am still tired from the trip and need to go to bed. I just had to get these two on the blog because I think they are my favorites, and I wanted to share them with you. I love this time of year! After a cold, deary winter, to have warm, sunny days and flowers certainly makes for lifted spirits. 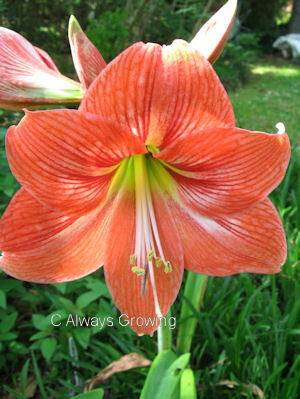 The amaryllis have started blooming. Since I live in a mild climate, I am able to grow these bulbs in the garden, and they normally bloom in late March, early April. I usually buy a few around the holidays, but this year I didn’t and regretted that decision. I missed having the flowers in mid-winter. Luckily, I get a second chance at these flowers come spring time. One of my favorites has just started blooming. This is a true red, not an orange red which I do not find as attractive. Another is a soft orange or salmon color. Both of these amaryllis were given to me by friends who have now moved away. Every time I see these flowers, I always think of these two generous gardeners who shared a bit of their garden with me. Right now, there are three varieties of amaryllis blooming in the garden (I posted about the earliest bloomers just a few days ago), and there are still a few more that should be blooming very soon. 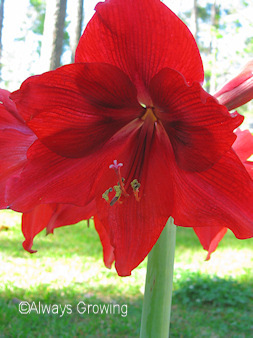 All these big, amaryllis blooms showing up now makes up for not having any during the dead of winter. I knew once blooming started in my garden this year, everything would just explode into bloom all at once. It seems that normally one new thing would bloom, then another. Not this year, I can hardly keep up with the new flowers. 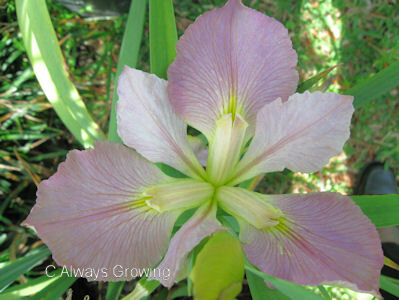 A few days ago, I posted about the first Louisiana Iris to bloom, Marie Dolers. Now, there are others that have joined in. My oldest Louisiana iris, Bayou Classic, has started blooming. 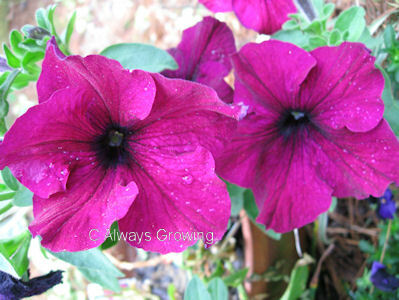 This is such a great flower – big and goes with everything. I had hardly notice Bayou Classic when I turned and saw Kay Nelson, another LA iris, I just discovered last year was also blooming. Even though there is a tremendous amount of new blooms showing up now, I am still able to stop and enjoy these two lovely flowers. I have to learn patience. Whenever I buy a new plant, many times I have unrealistic expectations. I always expect plants to grow faster and bigger than is really possible. 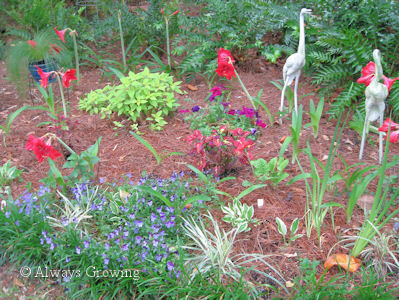 Perennials need time to get established, but I have a hard time accepting that fact. If I buy a plant, I want it to flower the first year. I have such a hard time waiting for plants to mature. Case in point, two years ago I purchased an Queen’s Wreath (Petrea volubilis) vine on the recommendation of a nursery worker. He said when it bloomed, it was gorgeous. Since he had steered me to other wonderful plants, I bought this vine. I knew that it was too late for the vine to bloom that year, but surely it would bloom the next year. No such luck. Nice foliage, but no flowers. How disappointing! This year, however, the first blooms have appeared. It seems that this vine only needed a little time. 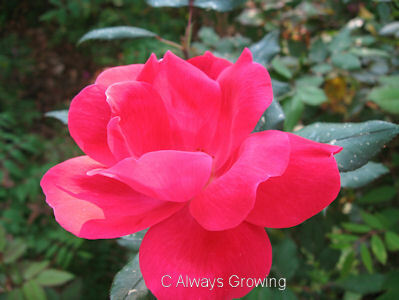 While not many blooms are appearing, at least I know what they look like and what to expect as it grows larger. Many plants that I have been disappointed with have finally grown big enough to make a nice showing now when they bloom. I now know that the same is going to happen with the Queen’s Wreath. It is not the plants fault that I have been disappointed, it is my own impatience – something I need to work on. Big and beautiful is the only way to describe this flower. The first of the Louisiana irises has started blooming. 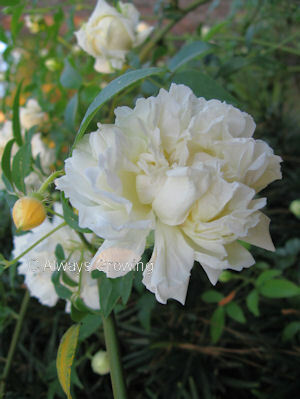 This one is Marie Dolors which puts out big, white flowers. I have this particular iris placed in the garden with Iceberg roses and white violas, and the three make a very nice combination. There is also white lilies nearby, but this year they are not blooming at this time. 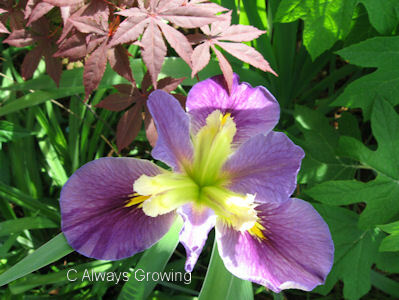 Marie Dolors is a very vigorous iris and has done very well for me. 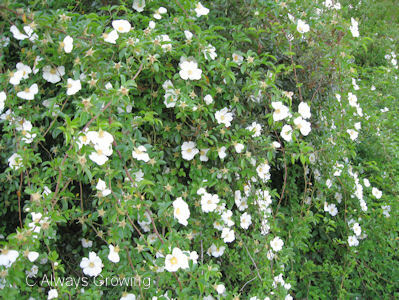 The flowers are supported by thick stems which are showing multiple flowers blooming at the same time. This is only the second year I have had her, and already she has multiplied well. 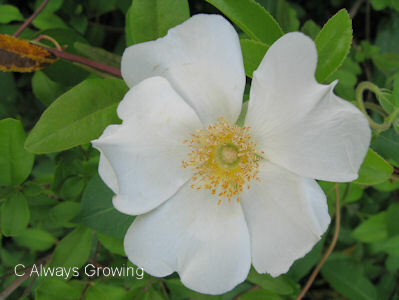 In another couple of years, there should be a good stand of this white beauty. I really like white flowers, and this one is surely making this section of the garden lovely. Gardens can be so sensual. It is easy, however, to appeal to the sense of sight with all the beautiful, colorful flowers and textures while the other senses are often overlooked. Wind rustling grasses or water features will fulfill the sense of hearing, but the sense of smell is often relegated to close inspection of flowers. 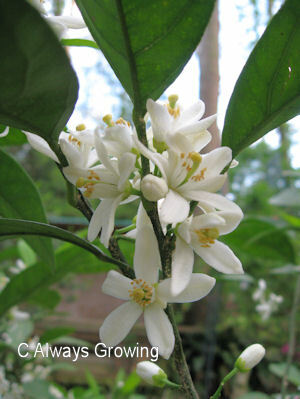 Right now, you do not have to be close to the flowering citrus trees to smell their wonderful fragrance. They are perfuming the whole garden with an absolutely delightful scent. 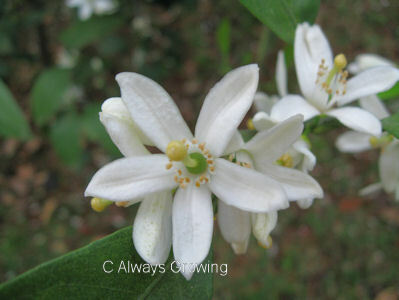 We have satsuma and lime trees, and all are blooming. I know now why orange blossoms were so popular for brides years ago. 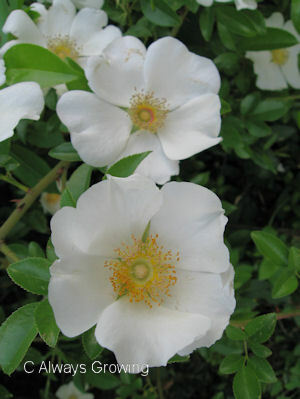 The fragrance is not overpowering or cloying, but so fresh, floral, and spring like. The heady perfume is not the only plus to citrus trees, the promise of fruit come early fall is just as important. This year there seems to be an abundance of flowers, and while not all will set fruit, it sure looks like there will be a bumper crop. 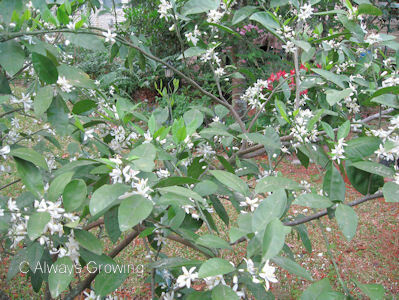 With beautiful flowers, wonderful aroma, and delicious fruit, it is no wonder that citrus trees are so popular. This is such a great way to keep track from year to year what is blooming in a particular month, but next year I will have to keep in mind that many of 2010’s April’s blooms are unusual because of the extremely cold winter we had many flowers have shown up two to three weeks late. March had little blooming, and now April has almost an overabundance. 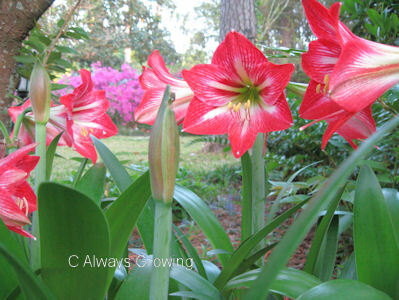 The garden amaryllis have just started blooming. Of course the azaleas are the predominant flowers now. The roses have started blooming. 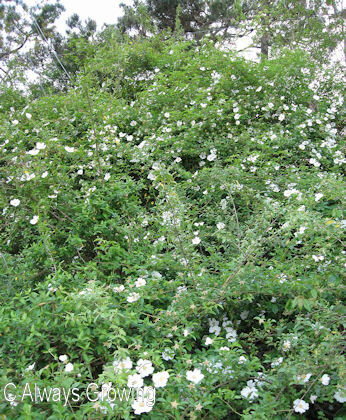 The white Lady Banks rose is doing very well this year. 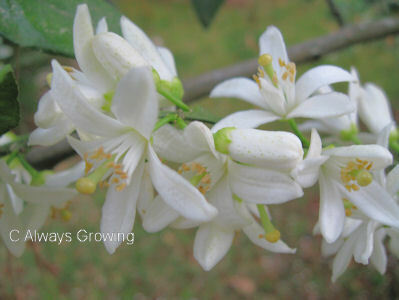 The citrus trees are blooming and perfuming the entire area. 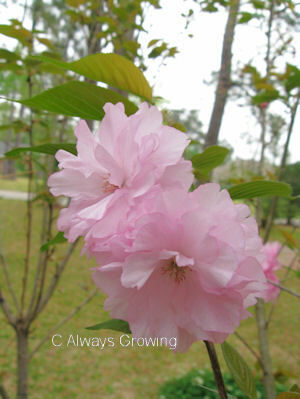 Kwansan cherry trees still are blooming though many of the flowers are starting to rain pink petals when the wind blows. 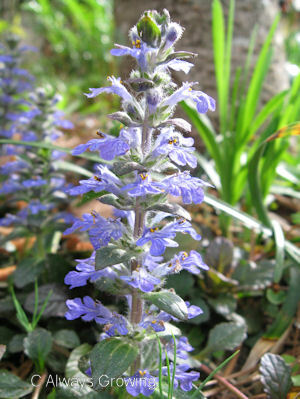 Even though the flowers are small, the ajuga is making up for that with the quantity of flowers this year. Also, still blooming are the violas and petunias. 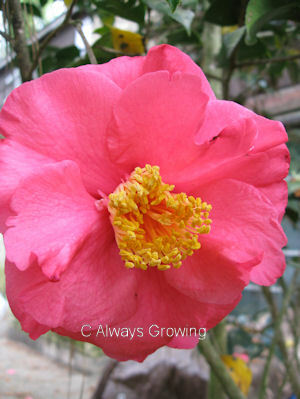 The day blooming Jessamine has started blooming, and the last camellia has finally opened. 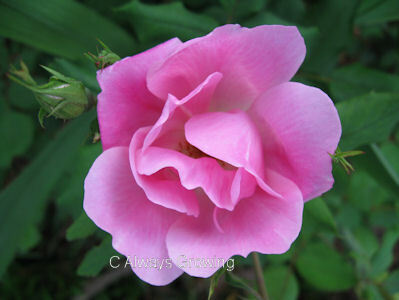 All in all, this has not been a bad Garden Bloggers’ Bloom Day. In fact, it has encouraged me to look forward to April’s. 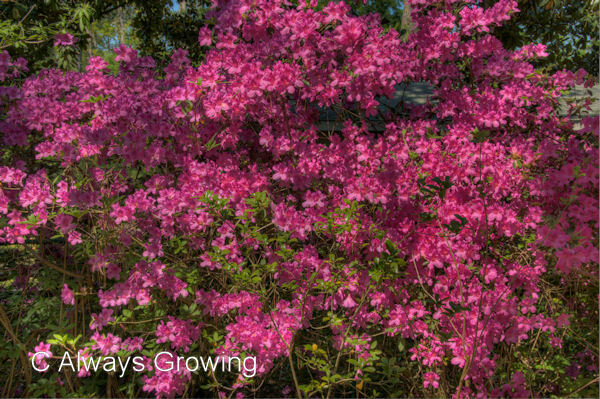 It is the peak time for the azaleas. With the cold winter we had, it seems the flowers are showier than they have been in years. 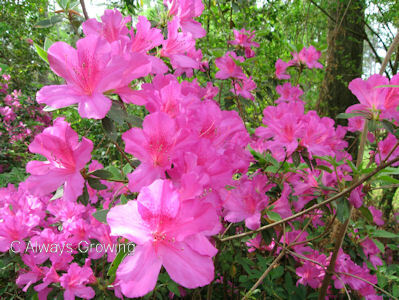 Every neighborhood is awash in azaleas from the small varieties to the large shrub ones. 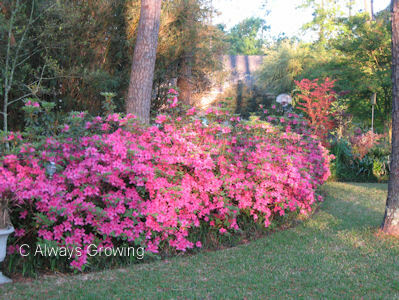 In fact, whenever I see a large azalea, I am reminded of antebellum ladies with their large hoop skirts. Mother Nature is certainly putting on quite a show this spring, and after such a dreary winter, everyone is very appreciative.